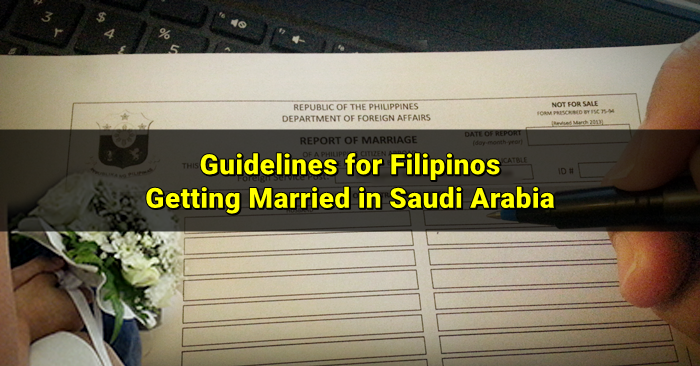 Filipinos who have been living in the Kingdom of Saudi Arabia can process the Report of Marriage at the Philippine Embassy. Below are the process and requirements that can guide you. NOTE: Only marriages between Filipino nationals are performed by an authorized or duly commissioned consular officer within the Embassy premises. 2. Original Certificate of no Marriage (CENOMAR) from NSO (Issued at most 6 months prior to the date of submission to the Embassy), authenticated by the Department of Foreign Affairs, Manila. 3. For contracting parties aged 18 – 21 years old: Parental consent notarized and authenticated by DFA (with red ribbon). 4. For contracting parties aged 21 – 25 years old: Parental advice, notarized and authenticated by DFA (with red ribbon). 6. For contracting parties with Annulled Marriages: NSO issued Amended Marriage Contract authenticated by the Department of Foreign Affairs (with red ribbon); Certificate of Finality of Decision and Court Order authenticated by the Department of Foreign Affairs (with red ribbon). 7. Passport copy of each party (data page only). 8. (2×2 photo) 2 pcs. for each party. 9. Application FORMS for Marriage: Available in the Embassy’s website http://www.riyadhpe.dfa.gov.ph/ and at the Consular Section. 3. After ten(10) days of the prescribed public posting of your marriage, arrange the schedule of your wedding with the concerned consular assistant at Tel.No.01-4823816; or e-mail: consular1@philembassy-riyadh.org. Note: YOU ARE ALLOWED TO HAVE A MAXIMUM OF FOUR (4) VISITORS/GUESTS ONLY TO THE CEREMONY IN THE EMBASSY’S PREMISES. Previous post: How to be an efficient civil engineer in Saudi Arabia?